Mr Tusk’s office took a staggering four-and-a-half hours to release a statement from the Eurocrat responding to Mrs May’s speech. The former Polish Prime Minister described Mrs May’s controversial Chequers plan for Brexit as a “step in the right direction”. But he claimed the UK’s stance at the European Council summit in Austria yesterday was “surprisingly tough and uncompromising”. Striking a conciliatory tone, Mr Tusk ended the statement by saying he was a “close friend” of the UK and a “true admirer” of Mrs May. His comments came after Mrs May’s Downing Street address, in which she refused to abandon her Chequers proposal. She also threatened to walk away from exit negotiations if Brussels does not come forward with fresh proposals on Northern Ireland. 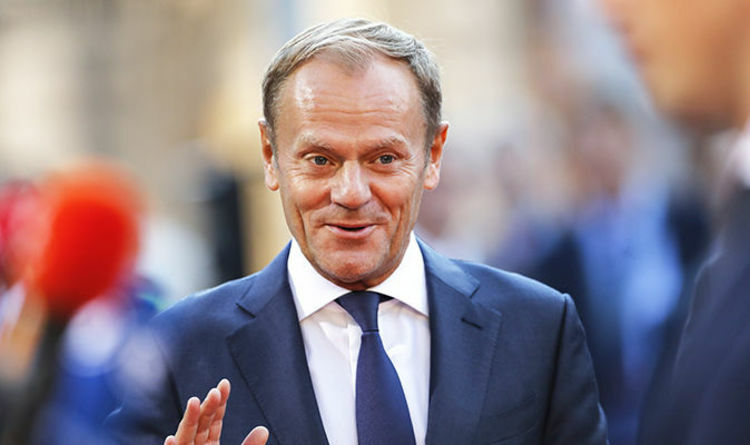 Mr Tusk said: “The European Union and its leaders fully respect the UK’s decision expressed in the referendum on leaving the EU. “From the very beginning of the negotiations, we have been focused on finding a deal that will minimise the damage resulting from Brexit. “Also important to us is to create the best possible relations between the EU and the UK in the future. “We studied the Chequers proposals in all seriousness. “The results of our analysis have been known to the British side in every detail for many weeks. “After intensive consultations with member states, we decided that for the good of the negotiations, and out of respect for the efforts of Theresa May, we will treat the Chequers plan as a step in the right direction. “The UK stance presented just before and during the Salzburg meeting was surprisingly tough and in fact uncompromising. “The response of the EU27 leaders was to reiterate our position on the integrity of the single market and the Irish backstop. “While understanding the logic of the negotiations, I remain convinced that a compromise, good for all, is still possible.